“I feel like our motto was — once we were out of the playoffs — it was kind of like, ‘Let’s mess up other teams’ seasons by giving them a loss'” said Delon Wright, who had 18 points and a career-high 13 assists. “They played great, but that’s our fault,” Schroder said. But Westbrook couldn’t continue the pace, missing all three shots in the fourth. Memphis pushed the lead to 103-90 after Dorsey connected on a 3-pointer with 4:42 left. 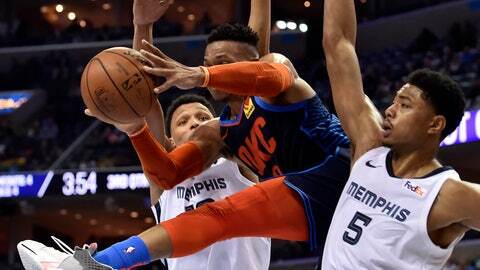 The Thunder never got closer than seven down the stretch as Memphis sent another playoff contender home disappointed. Thunder: This was the second game of a two-game road trip, the last multiple-game stint away from home for Oklahoma City this season. …The loss ended a nine-game winning streak for Oklahoma City over Memphis. … C Steven Adams was limited to two points, making only one of his seven shots. … George recorded his 23rd double-double. It was his 30th game with at least 30 points. Grizzlies: Starting PG Mike Conley (left thigh soreness) and reserve C Joakim Noah (right knee soreness) sat out. . Had not defeated the Thunder since Dec. 29, 2016. … Caboclo’s previous career high was 16 points on Feb. 7 at Oklahoma City. .Valanciunas recorded his fourth straight double-double. … Memphis won its first game this season with Conley sitting out (now 1-5). Memphis outrebounded Oklahoma City 57-41. The Thunder entered the game averaging 48.1 rebounds, second-best in the league, while Memphis is next-to-last with a 41.3 rebounding average. The 57 rebounds also matched a season high for the Grizzlies. Memphis had 57 on Feb. 25 against the Lakers. Caboclo’s 11 rebounds tied his career high. The Thunder entered the game in the sixth playoff spot in the West; they left tied with the idle San Antonio Spurs for the final seed. Because of the Thunder’s loss and Utah defeating Phoenix 125-92, the Jazz moved into sixth place.